Grow up? No thanks. Grow a new limb? No problem. Native to just two lakes in central Mexico, the axolotl, Ambystoma mexicanum, looks like something out of a sci-fi film. Besides the innocent smiley face and tiny legs, the axolotl’s most eye-catching features are its branch-like gills protruding from each side of its head. Gills on a supposedly adult salamander, you ask? Such are the results of an unusual trait called neotany, or paedomorphosis, in which larval stage characteristics are retained throughout life. This metamorphic failure is caused by a lack of the thyroid-stimulating hormone, which induces the thyroid to produce thyroxine that would make them full-grown salamanders. Quite simply, the axolotl doesn’t really grow up. 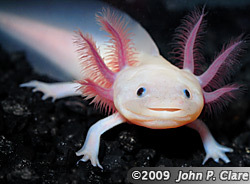 As if that wasn’t strange enough, the axolotl is also known for its amazing regenerative powers – the ability to regrow multiple structures like limbs, jaws, tail, spinal cord and parts of the brain (the list goes on) throughout their lives, a process very rarely observed in vertebrates. When a limb is amputed, the epidermis migrates to cover the stump in less than 12 hours, and changes in the underlying stump tissues soon result in the formation of a blastema (a mass of dedifferentiated proliferating cells). As the blastema forms, pattern formation genes are activated as they were when the limb was formed in the embryonic stage. Motor neurons, muscle, and blood vessels grow with the regenerated limb, quickly reestablishing the connections that were present prior to amputation. To top it off, the timely halt of fibroblast growth (which almost always causes scars in humans) ensures a perfectly scarless healing. Amazingly, axolotls can also readily accept transplants from other individuals, including eyes and parts of the brain—restoring these alien organs to full functionality. For these reasons, the axolotl is bred and used extensively in laboratories as a model organism. Unfortunately, it is now critically endangered in the wild (where it is usually dark grey in colour, instead of the albino form commonly seen in labs), where human development is pushing it to the brink of extinction. More should be done to ensure this miracle of an animal lives on in nature, shouldn’t it? Brandon, R., J. Armstrong, G. Malacinski. 1989. Natural history of the axolotl and its relationship to other ambystomid salamanders. Pp. 13-21 in Developmental biology of the axolotl. New York, NY: Oxford University Press, Inc.
Duellman, William E.; Trueb, Linda, “Biology of Amphibians“, 1994, Johns Hopkins University Press. Endo T, Bryant SV, Gardiner DM. A stepwise model system for limb regeneration. Dev Biol. 2004 Jun 1;270(1):135-45. Since my group and I are due for the extinction game this Monday, I thought it would be interesting to talk about…ooh, you guessed it, EXTINCTION. Can extinction be extinct? Or is extinction something that is inevitable? Can anything be done to actually stop this outcome? Is mankind the main reason for the extinction of animals or does it go much deeper than that? Mankind has always been associated as the main reason behind the extinction of animals. Yet, it also appears that we may now be their only chance of survival. Science and technology today is incredible. The truly amazing thing is how we are on the verge of cloning extinct animals, bringing them back into existence. In fact, just last year, the Centre of Food Technology and Research of Aragon, in Zaragoza, northern Spain, and the National Research Institute of Agriculture and Food in Madrid successfully cloned the extinct Pyrenean Ibex (refer to picture above)! It was the very first extinct creature to ever be brought back through cloning! However, the newborn kid died just seven hours after birth because of a lung defect (apparently, such lung defects are very prominent among other cloned animals, especially sheep). Interestingly, this has opened doors in hope “that it will one day be possible to reproduce long-dead species such as woolly mammoths and even dinosaurs”. How awesome would that be? The extinction game shows how mankind truly is NOT the sole factor in the extinction of animal species, and that other factors like climate change, failure to reproduce, mobility, predators, evolution, habitat changes also affect an animal’s chances of survival. A very clear example of an animal going extinct outside of human interference is the Golden Toad. 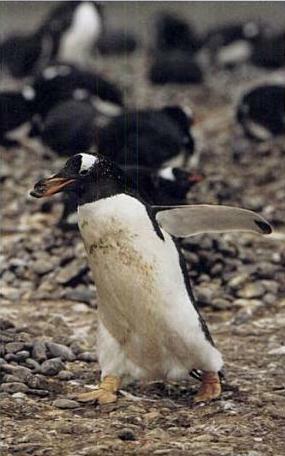 As you can see, its bright orange skin made it very distinctive. Native to the tropical cloud forests which surround Monteverde, Costa Rica, none have been seen since 1989. In 1987, due to the erratic weather, the pools of its breeding sites dried up before the larva could fully mature. Sadly, out of the potential 30,000 toads, only 29 had survived. The last recorded sighting of this toad was in 1989 and since then, none have been spotted. Research has been done on the reproductory behaviour of the Golden Toad and its breeding activity was associated with periods of heavy rainfall. Amazingly, between 1977 and 1982, these toads were breeding rapidly, with males outnumbering females quite immensely. It was reported that these toads were “explosive breeders” and so, to realise that they simply died out in 1987 came as a complete shock to researchers. This, to me, is quite reminiscent of the dinosaurs dying out (especially since it was even before humans walked the earth!). Nature does not always grant concessions to animals and many times, they go extinct because of natural or behavioural circumstances. I suppose ‘survival of the fittest’ truly applies to the evolution and continuation of animals. “Extinct Ibex is Resurrected by Cloning” by Richard Gray and Roger Dobson. Telegraph.co.uk, 31 January 2009. 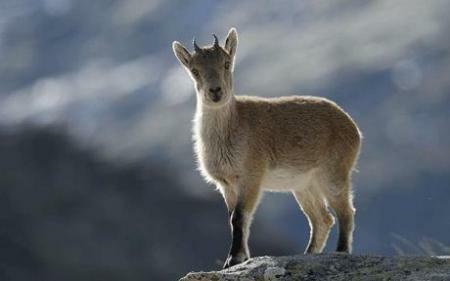 URL: http://www.telegraph.co.uk/science/science-news/4409958/Extinct-ibex-is-resurrected-by-cloning.html (accessed on 3 April 2010). 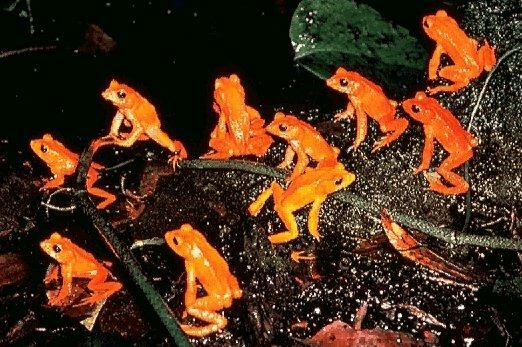 “GoldenToads-CostaRica” by the NOAA/OAR/ESRL PSD, Boulder, Colorado, USA. URL: http://www.esrl.noaa.gov/psd/spotlight/02062002/golden.html (accessed on 3April 2010). “Ibex_1250749c” by Jose Luis Gomez de. Francisco/naturepl.com. URL: http://zeitgeistinapetiole.wordpress.com/2009/01/31/unique-ibex-species-resurrected-from-extinction/ (accessed on 3 April 2010). “Reproductive Ecology of the Endangered Golden Toad (Bufo periglenes)” by Susan K. Jacobson and John J. Vandenberg, September 1991. Journal of Herpetology , 25 (3): 321 – 327. Honey, It’s the Big Bad Badger! Hailing from the unforgiving Kalahari Desert, the Honey Badger, Mellivora capensis, is “the most fearless animal” in the Guinness Book of World Records and “pound for pound the world’s most fearsome land mammal” in the magazine Scientific American. True enough, they decimate beehives for larvae (hence the name ‘Honey Badgers’), devour venomous snakes and even kill larger potential predators. 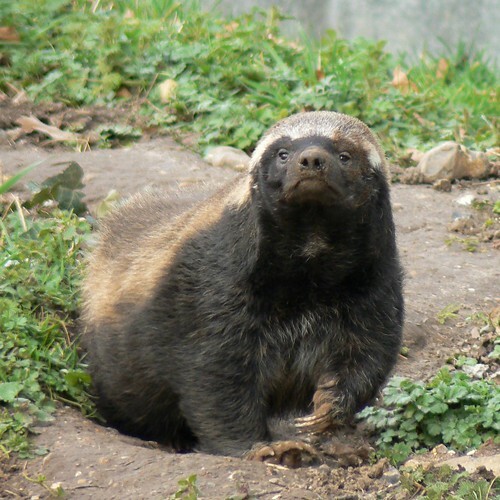 Surely, honey badgers are able to display aggressive behavioral tendencies towards other species due to physical traits like big front claws and thick, loose hide. But lo and behold, as if those overwhelmingly powerful traits were not enough, honey badgers seem to posses an uncanny ability that can be seen starting from the third minute of the video below. Yes, that uncanny ability is the resistance towards extremely toxic venoms from snakes. This further explains honey badgers’ almost insatiable appetite for snakes — which constitute more than half of their food consumption during summer — in providing high-energy meals without much foraging effort. So, are honey badgers so invincible till the extent of virtually bearing no costs during foraging? Fortunately this is not the case. They are actually vulnerable to predation by leopards and lions because of their relatively slow movement speed and become oblivious to the surroundings during digging. As such, despite the status of “most fearless animal”, honey badgers would prefer to avoid close contact with predators. Still, any predator will think twice about messing with the ferocious honey badger as the battle is certainly no walk in the park. “No, not a Bond girl. Seen at Howletts Wild Animal Park, Kent”, by Mark Bridge. Mark Bridge Galleries: Flickr. URL: http://www.flickr.com/photos/markbridge/3337947234/ (accessed on 29 Mar 2010). “Wildlife Collection 100 – Snake Killers 2of5 – Honey Badgers Of The Kalahari – 2001,” by Just4FunAndLOL YouTube Channel, 05 March 2010. URL: http://www.youtube.com/watch?v=MLPYRLj0rUk (accessed on 29 Mar 2010). “Honey Badgers,” by Colleen and Keith Begg. National Geographic Magazine, September 2004. URL: http://ngm.nationalgeographic.com/ngm/0409/feature6/fulltext.html (accessed on 29 Mar 2010). “Wildlife Collection 100 – Snake Killers 3of5 – Honey Badgers Of The Kalahari – 2001,” by Just4FunAndLOL YouTube Channel, 05 March 2010. URL: http://www.youtube.com/watch?v=1gZhPtaWsPY (accessed on 29 Mar 2010). Begg, Colleen Margeret, 2006. Feeding ecology and social organisation of honey badgers (Mellivora capensis) in the southern Kalahari. pp. 107-147.